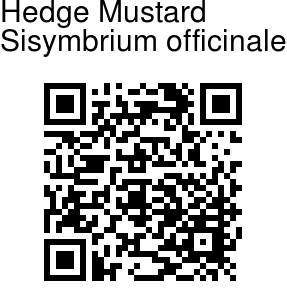 Hedge mustard is a plant native of Europe and North Africa, it is now well established throughout the world. It is an annual herb growing to 2 ft by 1 ft. 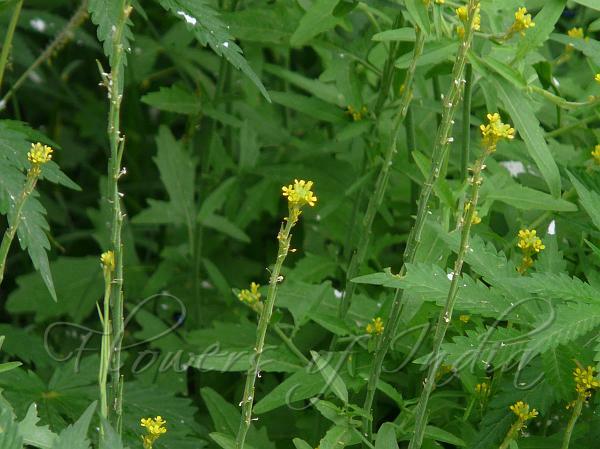 Initially, it forms a low rosette of basal leaves, which is followed by flowering stalks with alternate leaves. The stems are light green to purplish green, and usually glaucous. The basal and lower alternate leaves are up to 8" long and 2" across; they are pinnately dissected with several pairs of narrow lobes. The upper leaves are up to 4" long and 1.5" across; they are divided into 3 lobes or lanceolate-ovate in shape. The upper surfaces of these leaves are dull green and hairless; their margins are irregularly dentate or shallowly cleft. The basal and lower leaves have long petioles, while the upper leaves have short petioles or are stalkless. The upper stems terminate in long slender racemes of yellow flowers up to 10" long; axillary racemes from the upper leaves are also produced. The flowers are concentrated toward the apex of each raceme, while small narrowly cylindrical seedpods develop below. Each flower is a little less than ¼" across; it has 4 yellow petals, 4 green to yellow sepals, a stout central style, and several stamens.